Custom designed furniture gives your home its own distinctive style and look. Yes, it may cost a little more but it is an investment in style and quality that will last for years. Come and be inspired by the chic displays at our huge Carrocel showroom. Our knowledgeable and friendly staff will be happy to show you around and discuss your options. Built to your specifications: Furniture should be made to fit your rooms, not the other way round. After all, it plays such an important role in the look and feel of a space. Ever walked in to a home where you admired how the pieces were just the perfect size? That’s what custom furniture can do for you. Whether you have a uniquely shaped living room or hard-to-define corner in your bedroom, our pieces can be designed to fit your space and style. Designed to your style: Every individual and home is unique, so your furniture should reflect your distinct style. With custom furniture, you can have anything you want. Wood, fabric, leather, finish; you can choose! Combine two styles or design your own piece—at Carrocel our skilled craftsman can make your home décor dreams come true. Unique to your home: Nothing is more discomfiting than discovering that a friend or family member has the same sofa (right down to the upholstery and cushions) or dining chairs as you! Custom designed furniture has the special touch because it is truly unique. 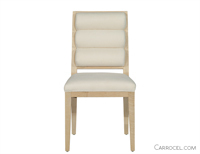 Quality you can trust: Each piece of custom furniture at Carrocel has a story behind it. Right from where the wood was sourced to how it was designed and finished. No matter what the story, the foundations are the same—reliable and traceable quality. You know and get what you paid for. Custom furniture also has another side to it that few people explore; i.e. furniture re-upholstery. You can create new and unique items out of existing vintage furniture in your home. Not only will you will save the furniture, but also avoid the cost and effort of buying an entirely new piece. 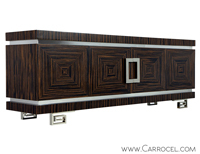 At the Carrocel furniture store, the possibilities are endless. Whether you are looking to restore the original look of your furniture or create something to suit modern day functionality, our skilled craftsman will deliver stunning results. For over 30 years, we have been providing high-end custom furniture and re-upholstery services to homeowners in Toronto and around the world. Quality materials, exceptional attention to detail, variety, fine workmanship and unparalleled customer service are the reason our clients come back again and again to visit our store. Nothing beats the quality and look of a custom designed piece of furniture; whether it has been restored or newly crafted. Your home will have its own, distinct style. Our experienced staff will be happy to show you around, discuss your ideas and help you make a selection. 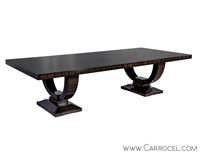 Call the Carrocel furniture store today at 416-999-2525 or contact us online to arrange a free consultation for your custom furniture.